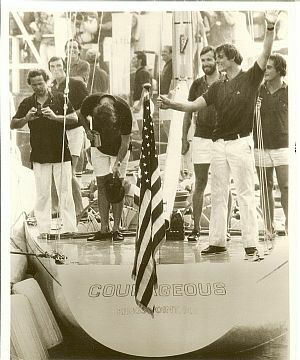 Ted Turner reforms his 1977 victorious ‘Courageous’ crew to commemorate their America’s Cup win 35 years ago. The AC exclusive video of skipper Ted Turner in Newport, Rhode Island, is epic in that it covers 35 years of sailing tech. Ted’s quest began with an AC defeat while sailing the “Mariner.” This bitter defeat was followed by his crew’s victory in 1977 while racing the 12-meter “Courageous.” Ted focused on recruiting a team of Sports Techie’s that pushed each other like a “Brotherhood,” to the Cup final victory. The era of “Hackendogs” was over and a new sports technology centric AC era emerged. America’s Cup is the mecca for sailing sports technology. Since 1851, sailors have been challenging or defending the Cup while pushing the envelope of innovation. There are major differences in boats since back in the old day. Boats used to have only one hull and now they have two. Plus, cloth sails has been replaced by a carbon fiber wing sail. Mastering technology to assist with winning the Cup is the new backbone of AC. The AC umpiring penalty system was developed especially for this Cup. On the water chase boats have been replaced by computers. According to Team Korea – “the new penalty system in place is still being changed, worked on, and is evolving” Rather than having to take a boat in circles to work off penalty minutes and seconds, teams are now being asked to take a short penalty with the assistance of graphics. An imaginary line is placed on the computer screen two boat lengths behind the penalized vessel. The skippers are supposed to stop and wait until the graphic on the TV screen gets even to their boat so they can start racing once again. 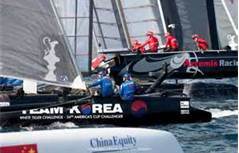 The new and evolving America’s Cup 2013 penalty system uses warning lights that flash colors. There are new warning lights that flash colors such as green, which means all is good to go. A flashing blue light indicates a penalty. A flashing red light means that another boat has raised a protest flag for a rules infringement. Using a computer to officiate is a sports trend that AC now faces for the better of the sport. AC has moved towards technological tools that assist umpires with data about where boats can and cannot go on the course. Taking the judgment away from officials and giving them tools to make the correct call is AC’s goal. Umpires are fed new video and graphic views which allow for closer scrutiny and a fairer race. Unfortunately, technology can be a part of any race’s problem when it does not function correctly. This recently happened when Team Korea got the short end of a stick when umpire replays showed them that their light indicating a penalty was on for too long. There is no redress course of action for Team Korea but the lesson has been learned by AC and everyone has since moved on from this race debacle. The LiveLine inertial navigation system tracks the race yachts with very high precision, within one inch of accuracy. LiveLine uses graphics to displays AC virtual boundary lines and fields of play. Go behind the scenes in Plymouth with the award winning LiveLine by watching the AC Discover video embedded in this blog. The video gives you a wonderful Sports Techie perspective of some of sailings marvelous sports technology innovations such as LiveLine. The LiveLine technological kit includes the sector antennae and amplifier. GPS antennae’s are mounted on a boat’s aft post and perform two-centimeter tracking. The aft post also has a mounted surround sound system and a camera. 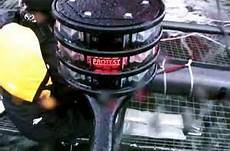 All the AC World Series boats have a pelican cases loaded with batteries used to power the LiveLine system, the telemetry, and an onboard TV. Powering the system base is critical for basic operation. All the AC45’s are loaded before the crew arrives in the morning. It takes about 30 minutes per rig of total set up and data check time. Another critical tech element is the race helicopter. The LiveLine hub on the ground inside of the TV building links to the data feed emitted from the helicopter. Understandably, the race helicopters can be affected by unpredictable winds and bad racing weather which can disrupt the LiveLine system functionality. When setting up LiveLine on shore, operators need to find a good view of the sky. They also need to be able to see the helicopter flying around while not interrupt other telemetry. LiveLine links to the helicopter and then uses surprisingly low-tech to track it. The heli feeds the computers in the TV building. The complex data is then rendered by their team to ensure that the LiveLine graphics layer is placed and seen on the television screen correctly. LiveLine displays graphics that show race status and information about where the boats are. The Sports Techie’s that produce LiveLine are connected to the race officer boat, the mark boat, the umpire boat, the marshal boat, plus the feeds to the nine yachts. The boats that capsized during the race resulted in lost connections and data feeds because the mast heads went underwater. At the end of each race, LiveLine disconnects the wing and recharges all the batteries to get the rig ready for another day of AC racing. LiveLine was founded in 1983 by sports technology pioneer, Stan Honey, Director of Technology. He previously founded Sportvision in 1998. Sportvision are the creators of the First Down yellow line for American football, the K Zone for baseball, and a proprietary NASCAR car tracking system. The company wants to make sailing more accessible for fans while meeting the needs of the technical and sophisticated committed viewer. Morphing tracking technology from land, to water, via the air, has been a massive AC challenge. Measuring a cameras’ pan and tilt from a non-tripod has had its issues. Measuring the location and angles from a helicopter has been difficult to achieve. LiveLine technology might actually be close to rocket science. The Sports Techie office is located near Shilshole Marina in Seattle. Sports Techie, I remember watching WTBS as a teenage kid with awe because of how Ted Turner made his vision of a superstation became a reality here in the United States. It is no surprise whatsoever to me that this Ultra Sports Techie turned an AC lesson in losing in 1974 to a sports business formula for success by 1977. Team Oracle is the defending Cup Champion and will face some intense competition if they want to repeat from the already lunched Emirates Team New Zealand, the Prada Luna Rossa boat from Italy, and Artemis Racing from Sweden. 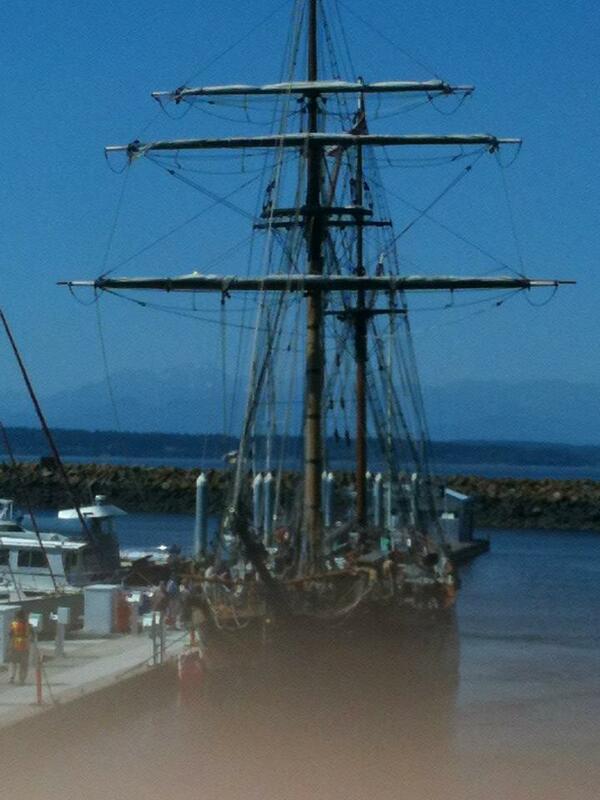 The Sports Techie office is located near Shilshole Marina in Seattle. As a result, I get to happily interact with all kinds of boating technology during the year at trade shows. I believe that AC technology is a difference maker for their sport, today, and into the yachting future. LiveLine sports technology is going to help the yacht racing become more mainstream. They will prove graphics during AC that explain what is happening and how the boats are strategizing for everyone’s benefit. 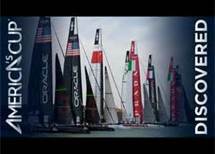 Thank you to Louis Vuitton, Official Timing Partner of America’s Cup World Series, for the YouTube video. AC sports technology is a true compliment to what World Racing Series 2013 is all about for competitors and viewers. Time and technology are indeed important components of AC. I hope our online community is as excited to watch the AC Challenge as I am, come September.